With autoranging horizontal scan frequencies from 15 KHz to 105 KHz, the SDG 900 Plus range is compatible with virtually any source including video, HDTV and high resolution computer graphics requiring resolution up to 1600x1400 pixels as well as with the standard personal computer. Such flexibility and resolution is only available from CRT technology. 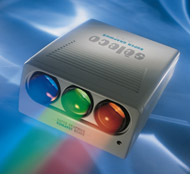 The SDG 900 Plus has three input card slots with a choice of RGB, Y/R-Y/B-Y, VGA and Video (complete with multistandard decoder and S-VHS input). The SDG 900 Plus offers input flexibility and is easily adaptable to suit varying needs. The RGB, VGA and Video cards are supplied as standard. Seleco SDG 900 Plus has been developed using the most advanced technology and is completely modular in design. Also, by using SMD technology with gold plated edge connectors the cables are minimised and therefore cross talk, video noise and electro magnetic emission are reduced. The Seleco Data Graphics projectors assure a superior quality and the high reliability required in professional applications. Ease of service is assisted by modular construction. The SDG 900 Plus Projector is easy to use and software controlled for convergence and set up and is supplied with both a backlit remote control for simple set up operation with on screen menu and a compact remote for the user. Every Seleco Projector is supplied complete with a mounting bracket and is front, rear, floor and ceiling compatible. The Seleco SDG 900 Plus provides truly excellent picture quality enhanced by an optional built-in Up Converter (real time line doubler). The board is connected via gold plated edge connectors directly to the motherboard in the projector. The Up Converter (SDG -UPC) is controlled by the remote control and uses IQTV technology which offers superior improvement to the video image by increasing the scan frequency of a PAL or NTSC signal (progressive signal or line/field doubling), stabilizing the images, reducing noise and improving sharpness. There are different conversion modes including 9 point median interpolation and Film mode which offers perfect motion tracking. SDG 900: the top of the range. SDG 900 is equipped with new 8 CRTs for exceptional high brightness and resolution. These CRTs are complemented by new HD8B lenses to provide high definition pictures. Selecos expertise combined with these new CRTs and lenses make the SDG 900 one of the brightest projectors in the CRT category (230 ANSI lumens). The SDG 900 offers great flexibility in being able to display every video source, all PC standards and the majority of workstation formats with resolutions up to 1600 x 1400 pixels and horizontal scan rate between 15 - 105 KHz autolocked. With an outstanding image high contrast, brightness and colour fidelity, the SDG 900 is ideal for electronic cinema applications. Lenses: HD8B, high definition fully colour corrected by multilayer coating. Main lens quartz glass. Focal length 140 mm. F number f/1.1. Focus adjustments for the centre and borders.